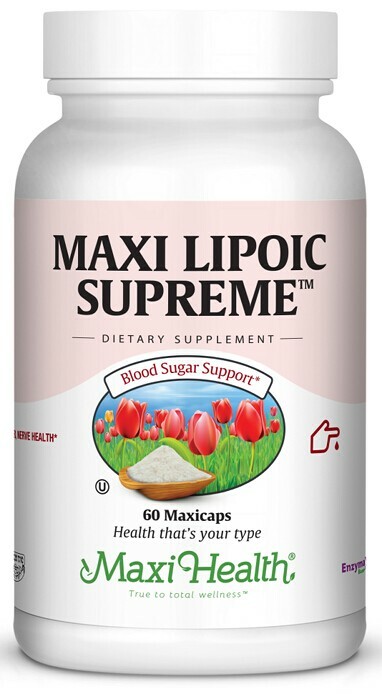 Maxi-Health Research® proudly offers you Maxi Lipoic Supreme™, which combines the universal antioxidant alpha lipoic acid, inositol, and choline. Alpha lipoic acid gives you antioxidant and energy enhancer support. It is better than vitamin E at inhibiting the creation of free radicals and protein oxidation. It also supports maintenance of normal blood glucose levels. Alpha lipoic enhances the production of glutathione, which supports exposure to excessive stress and toxic substances. We added inositol, which supports mood, the cardiovascular system, and immunity. Try Maxi Lipoic Supreme™ today. Take two (2) Maxicaps™ once or twice daily with meals, or as directed. Other Ingredients: Rice flour, vegetable cellulose, vegetable magnesium stearate, Enzymax® (calcium carbonate, bromelain, papain, lipase, amylase, protease, silica) and chlorophyll.